Norway is one of the most picturesque countries in the world, boasting stunning scenery, culture, food and activities for all adventure levels. Oslo, the capital of Norway is a metropolitan city that is home to world-class museums, art galleries, restaurants and a vibrant night life. 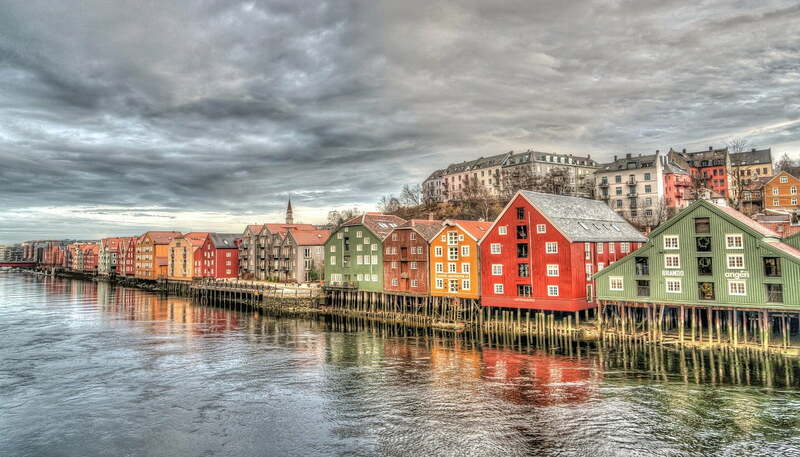 However, it is what lies outside of the main cities that bring most visitors to Norway. Majestic fjords, towering mountains, brilliant light shows in the winter sky, a sun that never sets, and glaciers, just to name a few. Norway also has over 80 islands stretching its western coast. Each island groups offers visitors a different perspective of Norway. The Svalbard Islands make up one of the most well-known Norwegian archipelagos in Norway. They are located in the Arctic Ocean halfway between Norway and the North Pole. Here you will find polar bears, the midnight sun in early spring and autumn, and 24-hour polar nights in winter. It is during this time you can experience the aurora borealis (Northern Lights) throughout the day and night. Another popular destination is the Lofoten Islands, found in the Norwegian Sea and very far north of the Arctic Circle. This region is renowned for fishing and the diverse landscape means that visitors can enjoy both water and land activities. In fact, the Lofoten Islands is one of Norway’s best surfing locations. Whatever islands you choose to visit in Norway, there are some very important do’s and don’ts when you are planning your island-hopping adventures. Do some research before you go and plan your vacation. Visit official tourist information websites or invest in some good guidebooks. Do go in the summertime to have endless days of sunshine. At Nordkapp, the most northern point of Norway and Europe, the sun shines for over 1,800 hours without setting. Do go between late September and late March if you want to see the Northern Lights. At this time of year it is dark between 6pm and 1am and this is when you have the best chance of experiencing them. Do stay in a mountain cabin (Hytta). The most authentic cabins lie in very remote locations, with no indoor plumbing or electricity. This means outdoor toilets and no running water. Be prepared to forgo a shower or two and take along some biodegradable personal hygiene wipes, body wipes and hand sanitizer. Do learn some of the language before you go. The majority of people speak English, but it’s always respectful to make an effort and memorize at least a few important Norwegian phrases. Do take lots of photographs and video to show your family and friends back home and share on social media. Do try the local cuisine. A Norwegian speciality is brunost or brown cheese. This versatile cheese is eaten thinly sliced on brown bread, melted into sauces and stews and even used as an ingredient in baked goods. Fish is also very popular. Apart from freshly caught seafood, Norwegians eat lutefisk, a fish dish with a gelatinous texture due to its preparation process of drying, soaking in lye and then in water. Don’t forget to pack appropriate clothing and equipment. Take clothes suited to the season you are visiting in and also to what activities you plan to do. Take a windproof and waterproof jacket and sturdy walking shoes or hiking boots. Dress in layers of clothing made from natural fibres such as wool and cotton. If you plan on camping, then a sturdy tent, warm sleeping bag and inner sheet will be invaluable. Don’t expect to be able to travel on a shoestring budget. Norway is an expensive country. Minimize some expenses by buying food, drinks and snacks from supermarkets but don’t scrimp on spending money on tours and activities that could be a once-in-a-lifetime experiences. Don’t expect to be able to cram your vacation into a few days. The Norwegian coastline is one of the longest in the world. From Lindesnes in the south to Nordkapp it is 1476 miles. If you were going to drive it nonstop, it would take you 39 hours. Have you ever been to Norway’s Islands? What are your top do’s and don’ts?